Paris - Four of the six teams who voted in favour of reducing the boat size for the 2017 America's Cup have issued a statement criticising Team New Zealand for their opposition. On Thursday, Italian syndicate Luna Rossa, who were also opposed to the reduction in boat size, withdrew from the 2017 Cup in protest at what it called the "illegitimate" decision. For the 2017 contest, boats will be shrunk from 62 feet (19 metres) to 45-50 feet (13.7- 15.2 metres) as a cost-saving measure. However, a joint statement published on the official America's Cup website and signed by defending champions Oracle Team USA, Artemis Racing of Sweden, Britain's Ben Ainslie Racing and Team France hit out at Team New Zealand. "We are disappointed to see how Team New Zealand are characterizing the rule changes that reflect the collective will of the America's Cup teams," the statement said. "During discussions last month, ALL six teams, including Team New Zealand, agreed on the need to change to a smaller boat to reduce costs. "While Luna Rossa supported a less dramatic change, a majority of teams agreed on what has become the America's Cup Class, a new rule written in consultation with ALL teams, with drafts of the rule sent to ALL teams for comment and feedback." "Each team that voted for this new America's Cup Class made compromises and sacrifices to get this done for the betterment of the America's Cup. "Taking these important decisions by a majority vote is something that was insisted upon by Luna Rossa and written into the rules of the event. "Regrettably, abiding by the results of the majority vote appears to be something neither they, nor Team New Zealand, are willing to do... unless they are part of the majority. 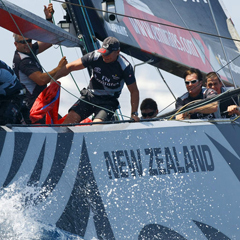 "We hope that Team New Zealand can see a way forward, as we all have, and look forward to racing them in the Americas Cup World Series later this year." Team New Zealand have yet to respond to the letter, although they did release a statement following the withdrawal of Luna Rossa, saying they were "deeply saddened". "We are quite frankly in disbelief that the continued actions of the America's Cup Event Authority have lead to the withdrawal of our great friends Luna Rossa," said their team CEO Grant Dalton. The 2017 edition of the America's Cup, which is the oldest international sporting trophy, will be held in Bermuda.